Recognised as one of the most fearsome marine predators that patrols the world’s oceans, the Great White Shark is one majestic animal. Perfectly designed for power and speed in the water, it cuts quite a figure as it hunts for food under the waves. 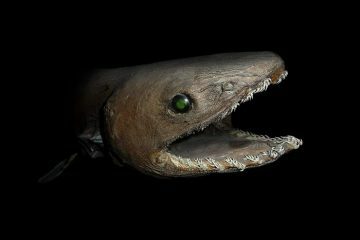 It is an animal that has caught the public’s imagination due to its brutal looks and inclusion in Spielberg’s classic Jaws film franchise. Also known as the Great White Pointer, they actually play a vital role in preserving the oceans delicate ecobalance. 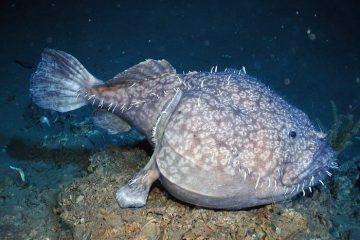 A breath-taking beast, they can be found in great numbers around coastal waters of the planet’s oceans, South Africa’s coast being a great example. 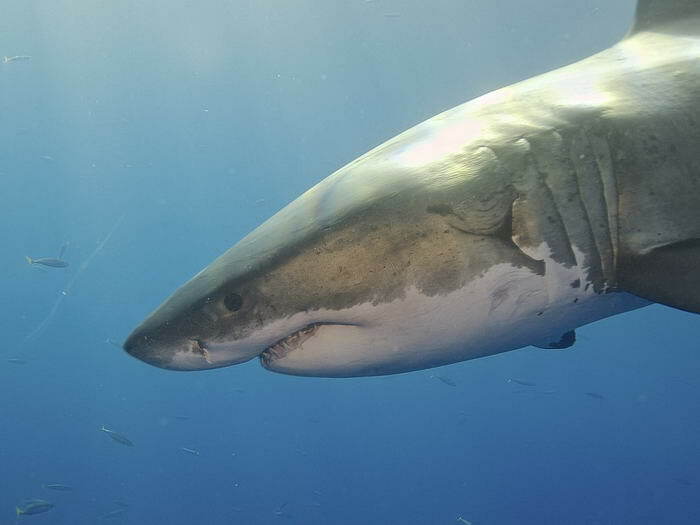 One of the most distinctive features of the Great White Shark is its colouring. The shark has a white underbelly and a dark grey upper half which is known as countershading. Now you might think this is just for aesthetic value but this is not the case. As always, mother nature always has a reason behind the way animals act or are designed. In this case, the countershading helps the shark when hunting for its favourite food, seals. If the seal is on the surface, the dark grey upper half just looks like the murky depths of the ocean. If it is underneath the shark, then the white lower body looks like the sunlight coming through the waves. In this way, the shark is perfectly disguised to strike the seal by surprise. Great White Sharks are superb hunters and a huge part of this is their huge jaws. Hence the film title! 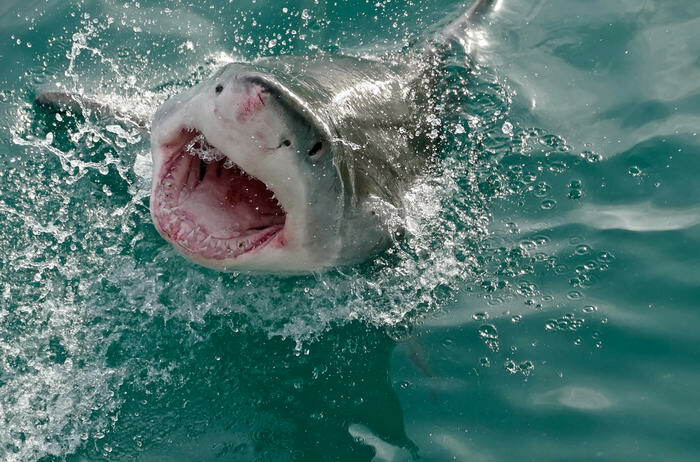 Each Great White has a massive mouth that is full to the brim with around 3,000 teeth. These teeth are serrated and very sharp to help it in catching and killing prey. Each tooth is triangular in shape and should any break or fall out, they simply grow back. This is a definite advantage when you compare that to the type of teeth humans have. 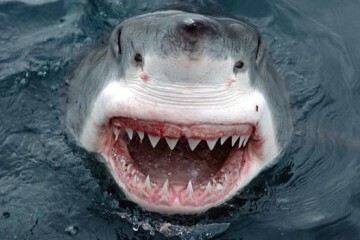 These 3,000 sharp gnashers are one of the reasons the Great White Shark is such a feared hunter. One of the more interesting aspects of Great White’s behaviour is what scientists call Spy Hopping. 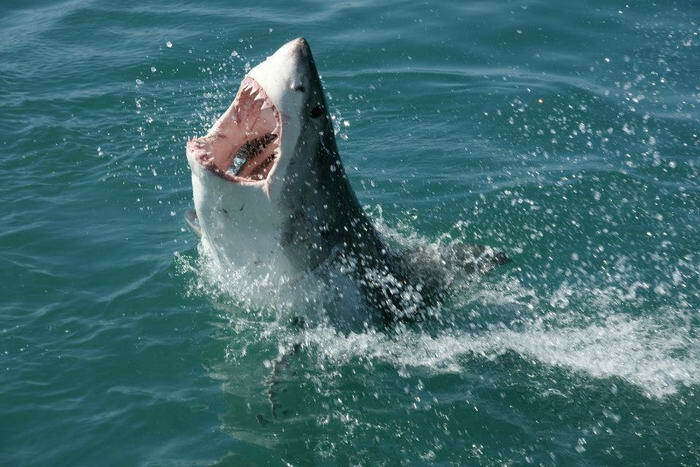 This sort of behaviour is particular to Great White’s among sharks and they are thought to be the only shark that does it. But what is Spy Hopping? This behaviour is where the shark will break the surface of the oceans water to detect prey. 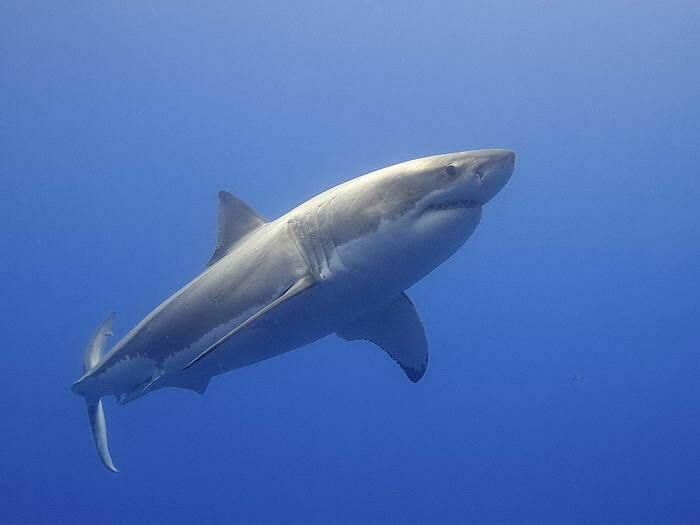 The reason is that Great White’s hunt by smell and smell travels quicker through air. 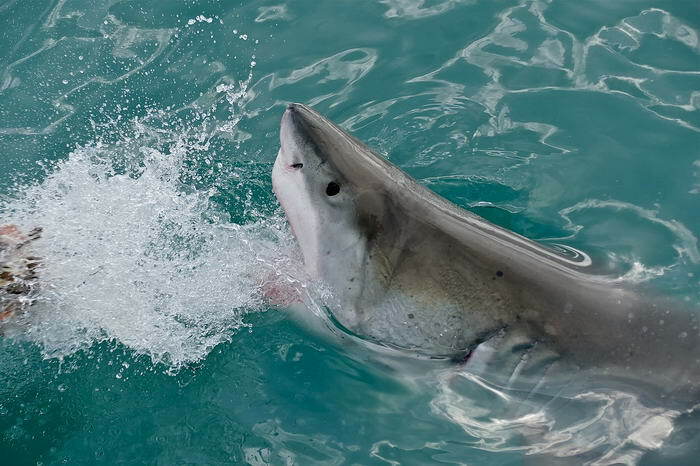 By breaking the water to smell the air, the Great White can pick up on any prey faster. Another peculiar aspect of this shark’s behaviour is what is known as Breaching. This is another tool the shark uses when it is hunting food but this time when it is going in for the kill. In breaching, the Great White will approach its target from below at great speed. By the time it recaches the prey, the shark is travelling around 40 km per hour and so hits it at a ferocious rate. Not only does this come as a total surprise to the unfortunate target but the way the shark jumps up out of the water as it clamps down onto it gives it no chance to react. 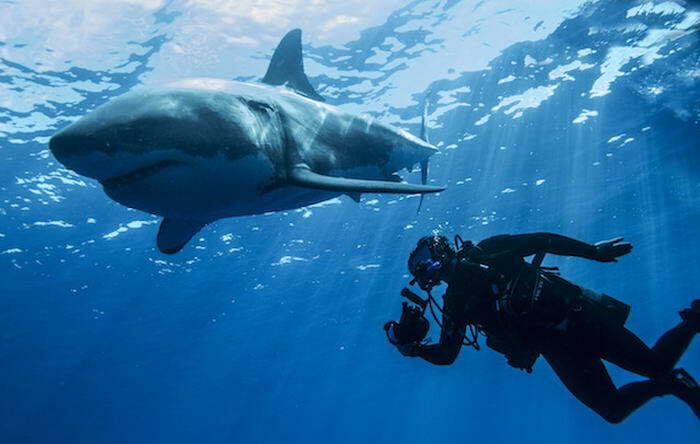 This a famous spectacle in relation to Great White’s and one that is quite something to see. 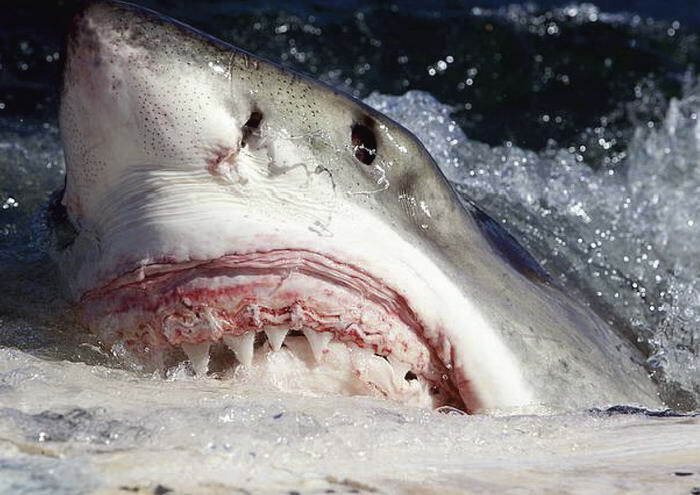 Despite the hysteria around these beasts, it is thought that Great Whites are not man-eaters by choice. 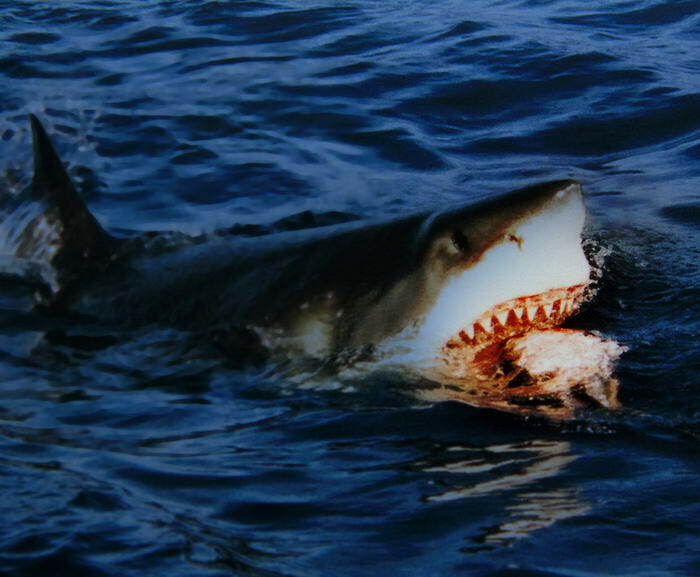 Sharks prefer fatty, blubbery meals like seals and so humans are far too bony for them to enjoy. However, there is no doubt that many humans have been attacked and some killed by Great White’s so what is going on? The main problem is that they very often mistake humans for seals especially if we are wearing wet-suits. As seals are their number one meal, they can attack humans by mistake – although this is no comfort to the humans on the receiving end! 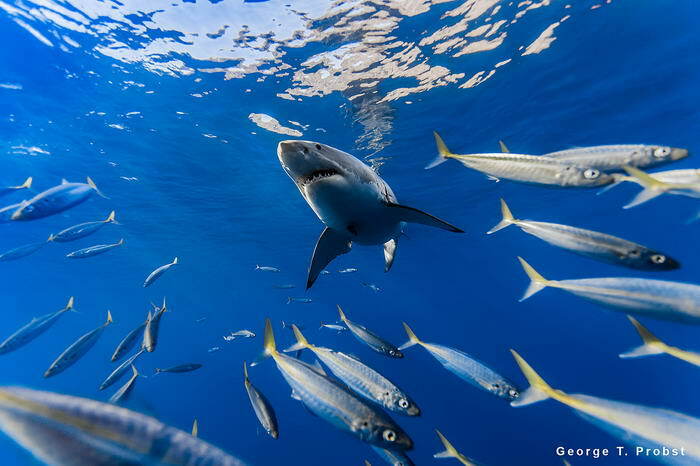 The other issue for humans is that sometimes sharks will give a light, exploratory bite to test what is in front of them. Unfortunately, as they are so powerful, even a light bite can cause us serious damage. To be fair, the Great White will eat pretty much anything! Some dead sharks have even been found with car licence plates and shoes inside their stomachs. Although it is no surprise that they eat most smaller fish that swim around, it is quite a thing that they devour bigger things. One of these larger prey animals is the Whale. When you consider how big Whales are compared to the Great White, this is stunning. Full grown Great Whites have the power and ferocity to hunt and kill Whales though and have no problem in doing so when hungry. Although the exact reproductive process of this shark is not fully known, scientists do know that female Great Whites are what is known as ovoviviparous. This means that they give birth internally which is pretty amazing when you think about it. In this process, the eggs are hatched inside the female Great White and kept inside her until they are strong enough. When ready, she gives birth to the pups who are then able to survive in their new watery home. We all love a young animal but don’t make the mistake of thinking Great White Shark Pups are all sweetness and light. As befits, one of the most feared predators around they are pretty ferocious, even when young. They are Oophagous which means the stronger pups will eat the weaker eggs while still gestating inside their mother! This just shows the killer instinct is bred into them from birth and why they are so good at hunting when born fully. 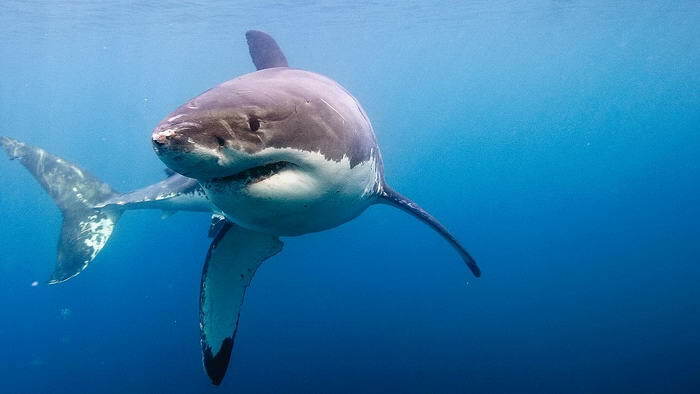 Although they are truly massive especially to humans, the Great White is not actually the biggest shark out there. In fact, it comes in at fourth but while it is not the largest, it is still considered the fiercest. But which sharks beat it in the size stakes? The biggest shark out there is the Whale Shark then it is the Basking Shark and Megamouth Shark. These are huge beasts but none of them can match the Great White in terms of hunting or its iconic status. The largest Great White caught in history was in 1945 off the coast of Cuba. The shark caught then was a huge beast as the photographs taken at the time showed. It was measured at 21 feet in length and 7,000 pounds in weight! It was obviously a shark that had eaten well over its lifetime and been very successful when out hunting! 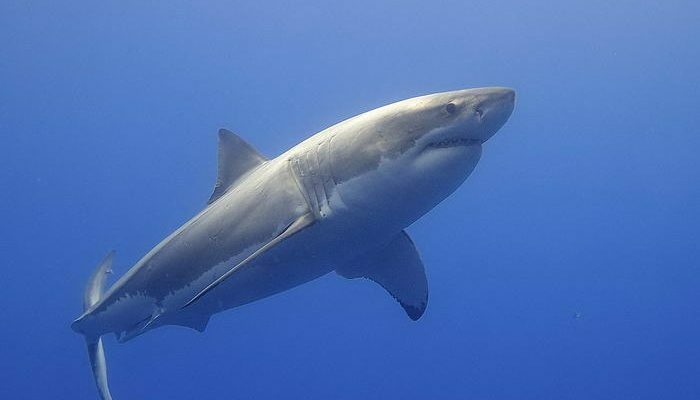 Although this is the top-end of Great White size and weight, standard Great Whites still grow to massive sizes as others that have been caught before and after prove. This size is part of the reason they are so powerful and are able to sit proud at the top of the ocean food chain. As you can see, the Great White Shark is not only a fearsome hunter but also a very interesting animal too. Although there are still some aspects of its behaviour that we do not know about, the above points give us a great idea of their behaviour and power. Although they do not go out to hunt humans per se, if you see a fin in the water you might want to get out of there quickly!